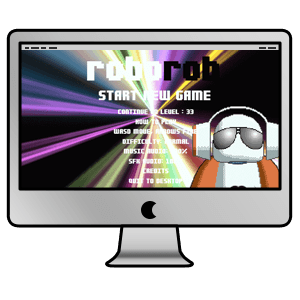 RoboRob is an old school shooter featuring the epic music of Rob Hubbard and has been lovingly crafted to help promote The Official Rob Hubbard Kickstarter. Obviously RoboRob is very much about Rob, but it is also a tribute to some of the awesome games of my childhood. RoboRob has been sent back in time to fight the enemies of his past and must battle through 90 levels to defeat the ultimate boss. Prepare to take a trip through memory lane in glorious hi-res explosion-vision! 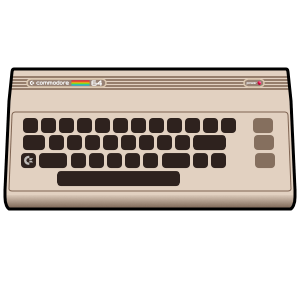 Not only does RoboRob pleasure your ears with over 30 of the finest c64 tunes ever made, it also features the voice of another c64 legend, Ben Daglish! Gameplay is easy - ideally plug in a controller, it's a twin stick shooter after all: left stick to move, right stick to aim your bullets. Simples. If you don't have a controller there are a variety of keyboard options. Want even more Rob Hubbard? You are in luck my friend. The Official Rob Hubbard Kickstarter has funded and is well under way! Featuring a brand new album co-written by veteran synth expert Marcel Donné, Rob Hubbard - The Official Reference book, an album of 10+ new Rob Hubbard SIDs and more, more, more. Let me download it already! If Windows SmartScreen pops up when installing, select "More info", then choose "Run anyway"
What PC do I need to play RoboRob? Although RoboRob features a lot of explosions it doesn't particularly need a beefy PC or laptop. What Mac do I need to play RoboRob? Although RoboRob features a lot of explosions it doesn't particularly need a beefy Mac. Arggh. My virus checker/Windows Defender is complaining about RoboRob. RoboRob has been virus checked to guarantee you a safe experience. Sometimes virus checkers are suspicious of unknown software and will warn you to take care. RoboRob has been code signed to guarantee it is from a trusted source but you may still get Windows Defender warnings (you need to pay big $$ for a different certificate to get round that I'm afraid) Just click the "More Info" button then choose "Run Anyway"
Also, a bit like Google, we get game analytics to let us know how people are getting on with the game and we use a global high score table, so it's possible your firewall may complain that we are trying to contact the internet. We're not collecting any information that could identify you, nor is the information being used for any purpose other that to monitor how difficult RoboRob is and to show high scores. I've found a problem. What should I do? Well, if it's a RoboRob problem let me know about it at [email protected]. Make sure you include as much information as possible, including your hardware setup, operating system and any virus checker you have installed. Yup, certainly is. RoboRob is here to promote the official The Official Rob Hubbard Kickstarter. Head on over to Kickstarter and help support it. Well that would be cool, wouldn't it. The code was built to support multiple players, but the levels would need to be tweaked to work with 2 characters. It's not quite the same, but you can use a controller and the keyboard at the same time (yes, really). One person controls the movement, one the steering! Good for kids! Reckon you've got what it takes to beat the best of the best? Get your name in here then.